Crab Apples along with Azaleas are one of the best flowering trees for use as bonsai. The Crab Apple genus Malus consists of around 35 species of deciduous trees and shrubs from woodland and thickets in Europe, Asia, and North America. Crab Apples are highly valued for their Spring blossom and colourful Autumn fruit. Fragrant flowers, mostly 2-5cm across, are borne singly or in corymbs and vary in colour according to variety. These are followed in Autumn by small fruit of differing colours. Leaves are alternate, oval to elliptic and most are toothed. 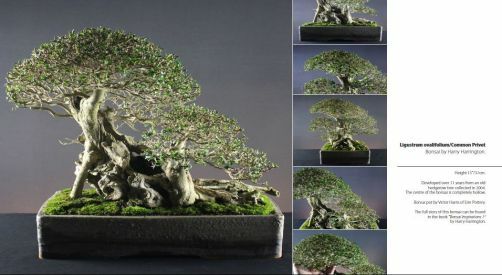 Though there are not many different species of Malus, there are many, many varieties, most of which can be used for bonsai. Varieties should be chosen for use as bonsai according to flower and fruit colour, also according to flowering ability; different varieties will produce different quantities of flowers. Malus sylvestris/ Common Crab Apple has leaves to 5cm long, pink-flushed white flowers in late Spring followed by greenish-yellow, red-flushed fruit to 2cm across. Native to Europe where it can reach heights of 9metres. Malus halliana/ Halls Crab Apple has pink flowers, glossy green foliage but purple fruits can be sparse. Native to China where heights of 6 metres can be attained. Malus cerasifera/ Nagasaki Crab Apple is the variety most often seen as bonsai due to its prolific white flowers that are pink in bud. These in turn lead to an abundant display of red fruit in the Autumn. Malus toringoides/ Toringo Crab Apple is a Malus species that has 3-7 lobed leaves to 9cm long with creamy-white flowers followed by yellow fruit. POSITION Full sun. Provide good air circulation to discourage mildew problems. Crab Apples are very hardy though trees in shallow pots may need some frost protection. WATERING Give plenty of water when fruiting. FEEDING Feed fortnightly until flowering. Feeding after flowering may cause leaf growth at the expense of fruiting. If trees are in training and vigorous growth is required at the expense of fruit, continue to feed fortnightly, otherwise cease feeding until fruit are well developed. To protect the vigour of the tree, it is better not to allow the tree to fruit every two or three years as fruiting weakens the tree. REPOTTING Annually in early Spring before bud burst using a basic soil mix. PRUNING In Spring prune back new shoots to one or two leaves. Trees should then be left unpruned until late Summer. Pruning must be undertaken by late August, otherwise vegetative growth is more likely to occur than flower buds for next year. Trees in training that require maximum growth can be left unpruned until leaf-fall. If fruit are not required, dead-head flowers as they go over. PROPAGATION Sow seed outdoors in Autumn. Cuttings of all wood-types in Autumn. Layering in Autumn if protected from frosts or in late-Spring. PESTS AND DISEASES As with other native species such as Hawthorn and Oak, Crab Apples attract a wide range of insects and diseases, particularly Aphids, Red spider mites, caterpillars, apple scab and mildew. STYLING Informal forms with single or multiple trunks in all sizes. Only small fruited varieties should be used for very small bonsai.